Story by Chan Hua Zheng/Red Sports. Photos by Lee Jian Wei and Lim Yong Teck/Red Sports. 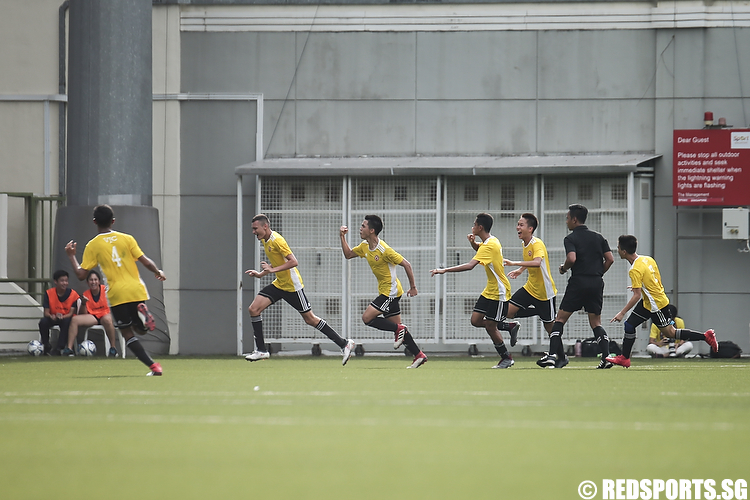 Jalan Besar Stadium, Monday, May 14, 2018 — Victoria Junior College (VJC) edged out Meridian Junior College (MJC) 1–0 with a stoppage time goal to snap the latter’s four-year reign in the National A Division Football Championship. “The second year players really wanted the title. Especially after what happened last year, they trained a lot harder. They also led the team very well as the team leaders,” commented VJC’s teacher-in-charge, Mr Tan Yew Hwee, after the match, reflecting on last year’s final defeat to MJC. “This was not a very good performance. I know that we could have actually played better, but ultimately we managed to put the ball into the back of the net and the boys had already done their best,” he further added on the team’s performance. The first half of the match proved to be an uptempo affair, as both teams pushed the pace on offense. MJC had possession of the ball majority of the time, but scoring opportunities were few and far between, as they struggled with mistimed passes that were easily picked off by the defense. On the other hand, VJC mainly relied on their counter attacks on offense. However, VJC found themselves unable to break through the staunch defense put up by a resilient MJC side. VJC came close to breaking the deadlock in the 31st minute when Glenn Kweh (VJC #10) fired a shot on target towards the bottom left corner of the goal that was deflected out of bounds by the goalkeeper. At half-time, both teams were tied 0–0. The second-half saw more action from both sides, as both teams were able to create more scoring opportunities through counter attacks. Jeremy Loke (VJC #20) came close to putting the ball into the back of the net after he fired a precise shot towards the bottom left corner of the goal that was deflected to safety by the goalkeeper. MJC had their opportunity soon after at the 58-minute mark, with Kaung Htet Lu (MJC #7) having his shot towards the left corner of the goal barely deflected by the goalkeeper. The last 10 minutes of the match saw VJC dominating possession, as their swarming defense forced MJC into coughing up possession. After earning a free-kick, Glenn Kweh (VJC #10) once again came close to scoring after his shot attempt soared just over the crossbar at the 73rd minute, drawing gasps from the 2000-strong crowd that attended the match. Just when the game seemed like it was headed for extra time, VJC would finally break the deadlock at the 80-minute mark, after Marcus Tang (VJC #5) received a cross into the penalty area on the counter attack and volleyed the ball over the goalkeeper into the bottom right corner of the goal, sparking celebrations from the VJC players on the field and sending the VJC supporters into a frenzy. As the game went into added time, drama ensued. A minute into extra time, Kaung Htet Lu (MJC #7) was able to head the ball into the back of the net from a corner during a frenzied aerial battle from both sides to gain possession of the ball, sparking celebration from the MJC players and supporters as they believed they had equalised. However, the referee disallowed the goal that could have sent the game into extra time, ruling that there was a push on the goalkeeper on the play, stunning the MJC crowd and causing some of the MJC players to react in shock and disbelief. Despite having their goal disallowed, MJC battled on in the dying moments of the game, hustling hard to try and create one last shot for an equaliser to prevent the end of their four-year title streak. However, time was not on their side as the referee blew the final whistle and with a 1–0 scoreline, VJC avenged last year’s final loss to MJC to bring home the gold.